Today, we’re excited to announce the public release of Sencha Architect 3! In this post, we’ll run down some of the product’s cool new features. If you can’t wait to get started, feel free to download it now. 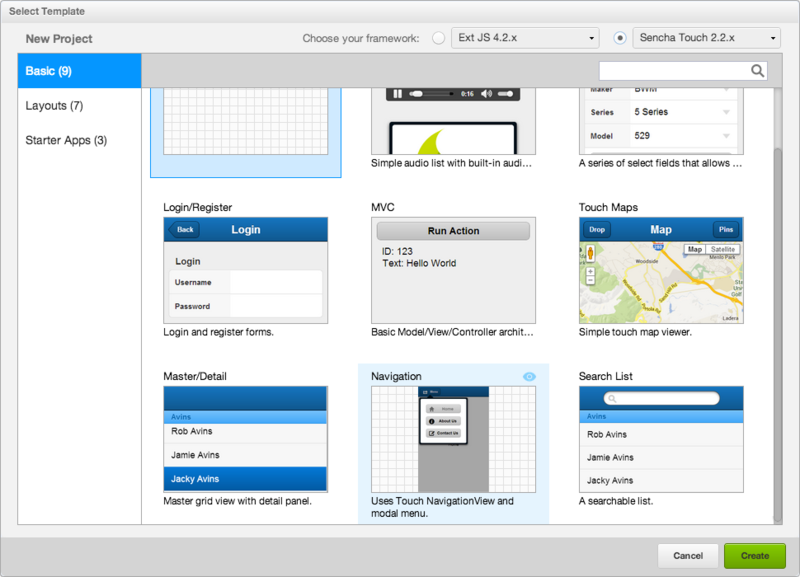 For those of you unfamiliar with Architect, it’s Sencha’s visual HTML5 app builder. Developers and designers use it to create powerful and beautiful mobile and web apps. Architect 3 is the fastest way to create apps that will reach more people on more devices. When you launch Sencha Architect 3, the first thing you’ll notice are a whole bunch of new App Templates. Use Templates to kickstart your project and get working on the more strategic aspects of your app sooner. Ever had to reskin UI components to match someone else’s visual design? Then we’ve got great news for you. 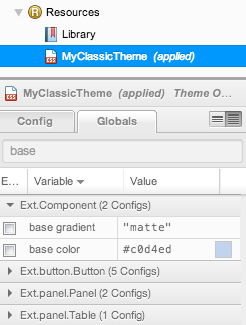 The new Theming feature in Architect 3 exposes the SCSS used to style Ext JS and Sencha Touch UI components. You can customize the look and feel of your app, and see your changes in Architect, all without digging through a bunch of complex CSS files. If you want to reuse and share your themes you can simply export them, and import into another project. 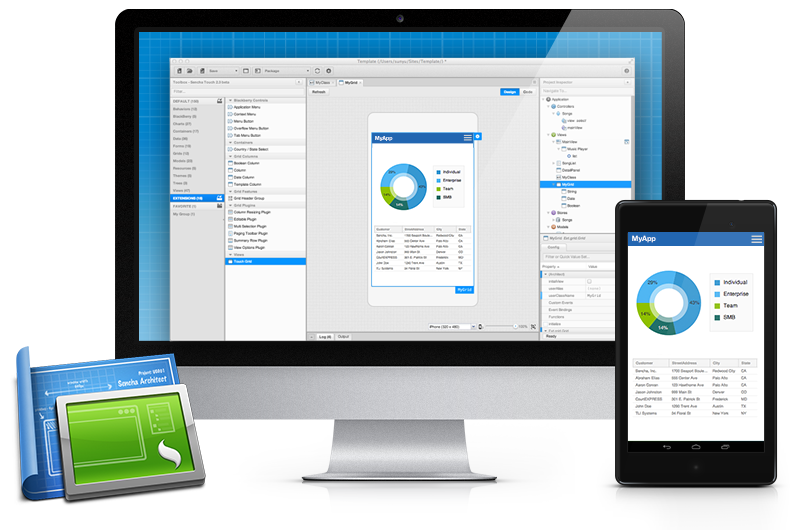 Architect 3 works with custom extensions built with the Ext JS or Touch frameworks. Extensions are bundles of self-contained code that can be imported into your project to add functionality. 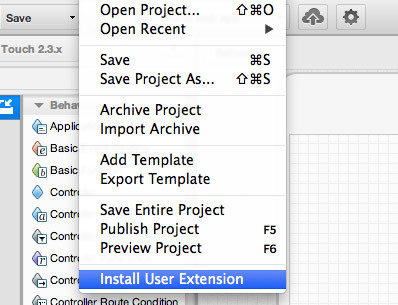 These extensions work like any other component in Architect. They can be dragged from the toolbox onto the canvas, rearranged in the project inspector, and configured in the config panel. Build your own extensions to share and reuse on other projects, you can find some or share yours on market.sencha.com. Maintaining a consistent user experience across teams has never been easier, because most of the features we discussed — Themes, Templates, and Extensions — can all be exported, shared, and reused. Long-time Architect users will be happy to know we’ve implemented some much-requested productivity enhancements like Code Completion. The first time you save your project in Sencha Architect 3, you’ll notice a prompt for build tools. That’s because Architect 3 is tightly integrated with Sencha Cmd, the command line interface for packaging apps. Architect automatically sets up your project, so it’s ready to go whether you’re debugging and deploying for the web, or delivering a native iOS or Android app. There’s so much more stuff to learn about. Check out the Webinars, Training, Certification, and HTML5 App Camps at the Sencha web site. Already own Sencha Architect 2?